Thank you for your interest in Troop 394 and welcome. 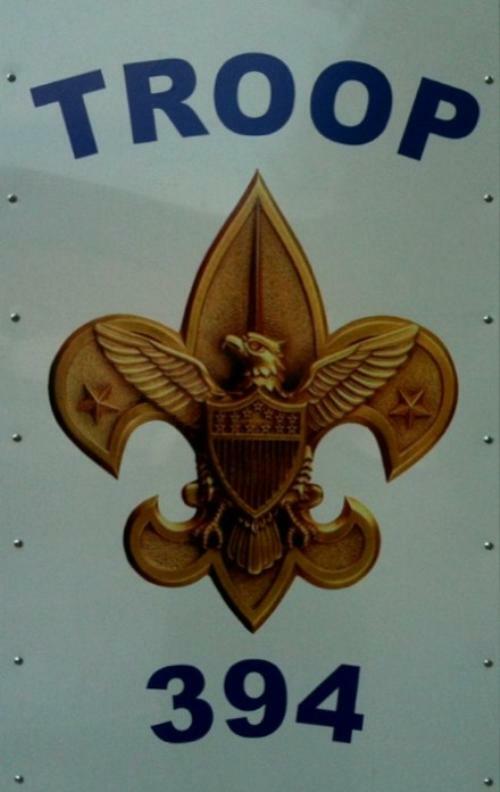 The Troop was founded in 2005 and since its inception the troop has had 11 scouts reach the rank of Eagle Scout. Troop 394 is a boy-lead troop, which means the boys are leaders, and make the decisions regarding their Scouting program. While this can be challenging, it allows the boys to grow in the many ways. Scouting is a value driven program and at Troop 394 we believe in giving boys the opportunity to experience responsibility and learn leadership skills preparing them for higher levels of scouting and life in general. The adult leaders of 394 are present to assist the scouts run the troop. All of our leaders receive 4 Training Classes (Fast Start: Boy Scouts, Youth Protection, This is Scouting, and Troop Committee Challenge) but many have also attended Scoutmaster / Assistant Scoutmaster or the highest level of scout leader training, Wood Badge. The Shoal Creek Community Church of Pleasant Valley, MO sponsors Boy Scout Troop 394 of the North Star District, Heart of America Council. We meet at the church located at 6816 S. Church Road, Pleasant Valley, MO 64068. Troop meetings are held every Tuesday evening from 7:00 to 8:30 PM. These meetings are broken into (a) PLC Meetings, (b) Troop Meetings, and (c) Courts of Honor. The monthly PLC MEETINGS are where program planning is developed for the next month’s Troop Meetings. TROOP MEETINGS involve working on specific skills, merit badges, advancement or other activities. The boys are expected to attend as many of these meetings as possible. We understand that school, sports and other activities sometimes create schedule conflicts but each boy is an important member of his patrol, whether it is making decisions or participating in activities; the patrol isn’t complete without him. If a boy can’t attend a meeting, he should let his Patrol Leader or the Senior Patrol Leader (the overall youth leader) know in advance. Four times a year the Troop Meeting is designated as a COURT OF HONOR where the boys are recognized for awards and advancement they have achieved over the previous months. Each Scout is asked to bring a treat to share with all the Troop Families. Families are invited and encouraged to attend Courts of Honor as they are special nights for our Scouts and should be shared with the entire family. (available only to registered adults) and it includes: the troop meetings, PLC meetings, Courts of Honor, campouts, and other activities such as fund raisers, Order of Arrow and other activities. In addition to the weekly meetings and periodic Courts of Honor, we stress complete Scouting program for the boys. We camp monthly where the boys will engage in activities such as hikes, bike trips, snowboard/ski trips at Snow Creek, IBEX climbing and other events. We are also involved with community service and other regional scouting activities. The point of all this is to help the boys become self-sufficient both “in the woods” and in other parts of his life. We attempt to build a self-confident and a well-rounded person. Advancement in scouting is very important and a major aspect of the scouting program. Advancement tracks the scouts learning, knowledge and progress toward the ultimate goal of Eagle Scout. Each boy is expected to work actively toward his next rank. It is important that the scout be encouraged to advance. Advancement teaches valuable skills and safety lessons used throughout life. Periodically, each boy will be counseled and reminded of the importance of rank advancement. It is said ¾ of “Scouting” is “outing”. We have an exciting and well-rounded outdoors program at Troop 394. We realize that there are parts of the boy’s life beyond Scouting, but outings are an important part of the Scouting experience and rank advancement. For a Scout to reach the First Class Rank, he must actively participate in the campouts. We camp one weekend every month (even in the winter months), and during the summer months we spend 10 days at Scout camp. Typically, weekend campouts start at about 5:00 PM on Friday at the church, with a return to the church around noon on Sunday. The boys will plan menus and shopping lists, and they with the help of an adult or older scout, will buy the food. When shopping with your scout, work with them to stay within their allotted budget as these are the beginnings of important life skills. The typical cost for a weekend outing is between $10.00 and $25.00 per person depending upon the type trip, distance, food required etc. For attending these outings, the boys will receive coups to wear on their belt. All Boys joining the Troop are eligible to attend summer camp. We attend Summer Camp at the H. Roe Bartle Scout Reservation near Osceola, Missouri, for 10 days in June, July, or August. Osceola is just south of Clinton, MO on Truman Lake. This is a wonderful experience for every Scout and the Troop strongly encourages all Scouts to attend. Parents often find camp motivating with all of the training opportunities afforded and are encouraged to come and stay 1 to 10 days. If your Scout wishes to go to summer camp, we ask that he become an active member of the Troop as soon as he joins. Our normal activities and weekend campouts will help prepare him for the experience. We’ve found that Summer Camp is a “grabber” – boys who attend camp the first year tend to be more successful and stay longer in Scouting. Some parents may think their Scout is too young for summer camp the first year, however almost all of the first year scouts go to camp and they all have a great time and camp jump-started their advancement. We highly recommend that all scouts, but especially new scouts, attend summer camp. The costs are affordable ($300 for 2013) and can be offset with fundraising, and the experience priceless. There is an annual registration fee of $24.00 for each Scout ($1.00 if the Scout is already registered through Cub Scouts) plus an additional $12.00 if you are interested in receiving Boys Life magazine. Annual Troop Dues are $120 and can be paid monthly, and covers the cost of registration ($24), every year after the boy joins Troop 394, Troop 394 neckerchief and slide, Merit Badges, Rank Advancement Patches and Pins, Mother’s Pin, Service Stars, camping coups, Eagle Neckerchief, and other Troop-sponsored awards. This fee can be offset by fundraising activities. If paying by month, the scout cannot be three (3) or more months in arrears at the time of Court of Honor to receive awards. The Troop Committee has the authority to change the amount of dues as deemed necessary. There are two uniforms the scouts wear. The “Field” (formerly known as “Class A”) uniform is the standard dress uniform of the Boy Scouts of America (shirt with required patches, pants or shorts with belt, socks, neckerchief and cap.) All scouts of 394 should have a complete Field or Class A Uniform. We provide a distinctive Troop Neckerchief that the Scout will receive upon crossover from Cub Scouts. Uniforms can be purchased through authorized Scout distributors; such as Brant’s on Liberty Square. The boys are expected to wear “Class A” uniforms to all meetings during the school year, and uniform inspection is held once a month during this period. The scout should wear as complete a uniform as possible for inspections. The “Activity” (formerly known as “Class B”) uniform is more casual and replaces the dress uniform with a Scout related t-shirt and casual pants or shorts. This uniform is worn at all campouts, summer camp, and to meetings during the summer. If you need assistance in finding or purchasing a uniform, please talk to the Scoutmaster or other adult leader. All Scouts are expected to wear their full Class A uniform to all Troop Meetings. Troop 394 requires that Scouts wear the khaki uniform shirt (including Troop 394 numbers, leadership position patch, patrol, World Crest is optional (purple patch)), Troop 394 or Eagle neckerchief & slide (or Eagle bolo), scout belt, and Boy Scout Coup on belt to be considered "in uniform." Scout pants, scout socks and scout cap are considered optional at Troop 394. The Order of the Arrow and Mic-O-Say coups (if earned) should be worn at ALL Scout functions even if the Scout uniform is not required. Merit badge sash and/or OA sash should be worn on more formal occasions such as Courts of Honor. The adult leaders will be happy to help you select the necessary equipment and we encourage you to ask. Buying the right items the first time will avoid having to buy again in the near future. Experience is the best teacher, but it can also be the most expensive. If possible, your Scout should help pay for his uniform and equipment as we’ve found the boys will often take better care of these items when they help pay for them. Birthday and Christmas gifts are also an excellent opportunity to add to his Scout gear. Completion of the scout physical form is necessary for weekend outings, summer camp or high adventure. We request that when your Scout has his yearly physical exam for school, you also have a Scout Medical Form filled out by your physician. A yearly update of personal information is required, as many changes take place with the family’s health insurance coverage over the scout’s time in the troop. Registered adults with the troop also must have medical forms on file. The health form can be found at the Troop’s website (http://bsatroop394.ScoutLander.com) under the “Forms” section. “Part A” and “Part B” are required for all scout outings. Part “C” of the Health Form is required for summer camp. Troop 394 holds a few fund raising activities over the year, with 80% going into the Scout’s personal account, and 20% going to the Troop’s general fund. There is a council sponsored Popcorn Sale in the fall which benefits the council, troop and the scout. 32% of the proceeds from the popcorn sale come back to the troop (80% to the scout’s personal account, which can be used for troop or scouting related fees and equipment.) A few other troop fund raising activities are scheduled through out the year and typically include a pancake breakfast, chili dinner, and selling trash bags. Occasionally the Troop Committee will designate a fundraiser “for the Troop” in which 100% of the profits go to the Troop, and is announced as such in advance. The proceeds from troop fund raising events are used to purchase camping equipment and other items that every troop needs to operate. Any fund raising suggestions are appreciated and welcomed. We also ask for your help by volunteering your time to help make our fund raising activities as profitable as possible. Your son’s success in Scouting depends, to a great extent, on the support he receives from home. He needs encouragement from you if he is to succeed. Your interest and support can do much to help him get the most out of scouting. Your presence at Courts of Honor, or your involvement in a Troop projects, meeting and outings will help reinforce his belief in the Scouting program. Troop Committee or Parent Meetings are held on the first Monday night following District Roundtable at the church starting at 7:00 PM (District Roundtable is held the first Thursday of each month.) All parents are invited to attend as Troop activities and outings are discussed. Please come to the meetings, give us your input, and if you can, please volunteer to assist the Troop. It will not survive without parental support and it’s fun and rewarding to work with the Scouts. We encourage all parents to join our Troop as adult leaders and become involved with Troop activities. If both parents cannot join we hope at least one will take an active role or consider being a Merit Badge Counselor especially if you have any special interests, hobbies, or avocations. The adult registration fee is $15.00 per year or $27.00 per year if Boys Life magazine is requested. You must be a registered member if you wish to accompany your Scout on monthly camp outs or Scout Camp. We also ask that even if you unable to become actively involved with the activities you still try to attend our Committee Meetings as often as possible. Thank you for your interest in Troop 394, a troop dedicated to keeping the fun in scouting while developing boys into young men in a value driven organization.